I hope all is good with you all! I whole-heartedly apologise for just how late this is! Life has been insane lately where education is concerned, what with Uni interviews and coursework deadlines slowly creeping up on me! Thankfully, today is quite an uneventful Friday right now, so I thought I would finally share my rather cosmetic-heavy favourites from last month! So as I mentioned, last month was rather heavy on cosmetic loving, and here were those! First on the left there is a Models Own nail polish, in the shade 'Pink Veneer'. It was part of a four-piece set I received for Christmas, and I recently switched up my emerald nails to ones of this colour, so they're looking very pretty in pink right now! The quality is outstanding, I've had "are they your real nails?" recently, but it's just said polish that has a wonderful gel effect! Next to that is the first Lush product I've ever owned! I actually won it through a blog competition, from the lovely Gill over at gillmcaughlin.blogspot.com, so I was thrilled to finally be able to try a Lush product, and for free at that! It was part of the cosmetic chain's Christmas range, the 'Santa's Lip Scrub'. It is cola flavoured and I happen to be a huge lover of the smell! The lip scrub works wonders on my lips, ironing over the parts that need it, whilst tasting lovely and looking cute, with little edible hearts in there too! Brilliant stuff. Next to that was a purchase I recently made as it was very much needed! This was a Seventeen Brow Sculpting Pencil in Natural Brown, just £2.89 from Boots! I was rather apprehensive at first because this seemed WAY too cheap to be true, but it was a rather decent result! I was in dire need of a new brow pencil as the current one I use is too dark, so this one will definitely do, especially as it includes a brush too! 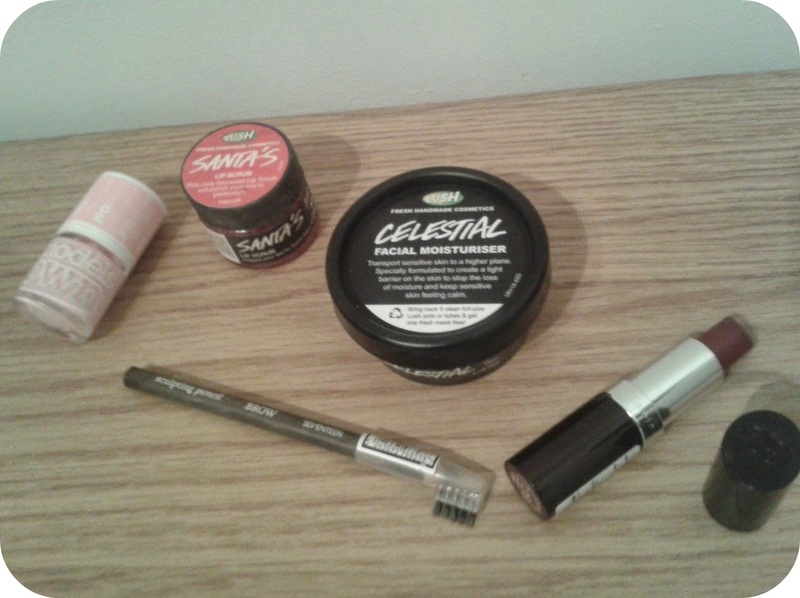 Ooh so next to that is a Lush product I forked out for myself very recently! It is the 'Celestial Facial Moisturiser' that did NOT come cheap at £12.50, but I was in desperate need for a new moisturiser so I thought I'd test it out! Anyway, it became another Lush product that I'm already loving, it provides an amazing result on my lacklustre skin! I am definitely getting the hype behind Lush. Lastly, my lipstick addiction is going absolutely nowhere as I managed to purchase ANOTHER one! This time back to trusty Rimmel again, my third purchase from them. This time it's the 'Starry Eyed' shade (no.128), just £4.99 from Boots! 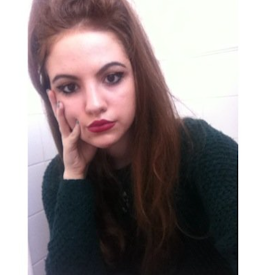 A wonderful brown/purple colour, definitely blowing the other recent lipstick purchases out the water. In LOVE with this colour and the quality! I've been quite a fan of the British YouTubers for about a year now, and Zoe and Tanya are both wonderful. The buzz surrounding Zoe's book was insane, and Tanya's was staring at me from the store shelf as well, so I HAD to purchase both, just £6.49 each from WHSmith, SO good especially for hardbacks! I do not care about the whole Ghost written saga or the 'they're YouTubers not authors!!' thing, I am reading them at face value. 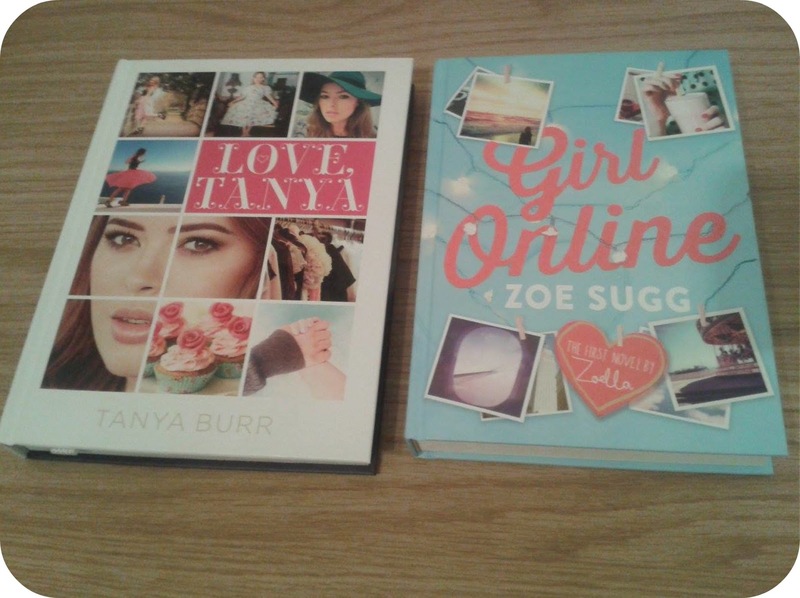 'Girl Online' and 'Love Tanya' are yet to be finished but I am enjoying them thus far! 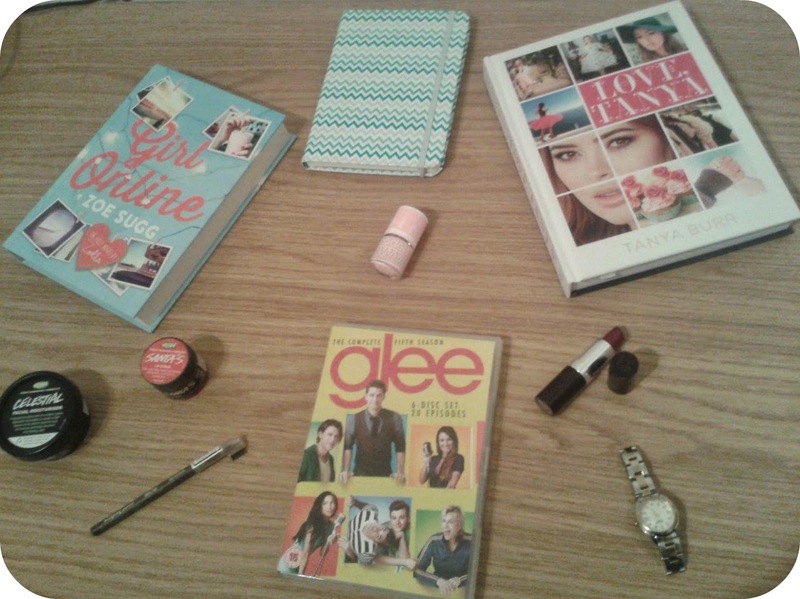 These are a few more bits and bobs I was loving this month! Firstly, I finally got round to buying season five of Glee for £20 from HMV, so that I can re-cap on that before season six airs in the U.K.! Loving re-watching it so far, a very strong start as well with the two-part Beatles tribute! For my mum's birthday recently, she became the owner of a brand new lovely Michael Kors watch, so her previous one got passed down to me, as not much of a watch wearer. 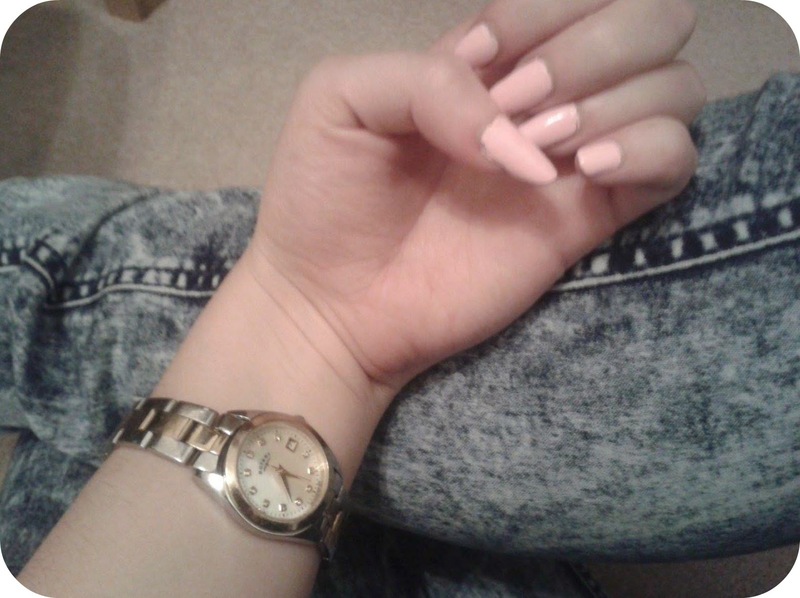 It's a lovely little Rotary one pictured above, featuring current pink Models Own nails! 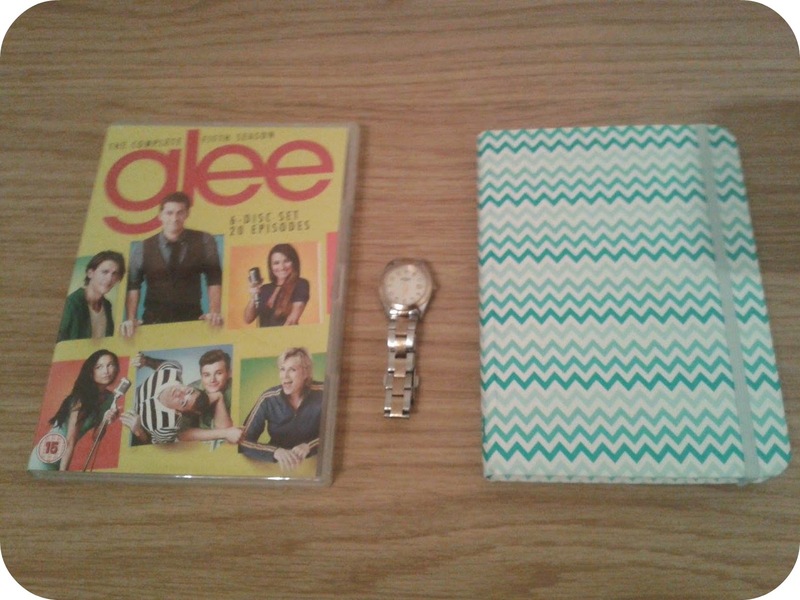 Next to that is this awesome zig-zag mint green and white notebook that I found in WHSmith following the book purchases! I was in need of a notebook for note taking for educational and blogging purposes (maybe even a diary if I was bored one day), and as a mint green enthusiast this was the one! Sadly, no matching pen was found. So guys I really hope you enjoyed my favourites, and apologies this was so late! I have two more posts planned to come soon, so watch out for those! Be sure to link me your own favourites in the comments! 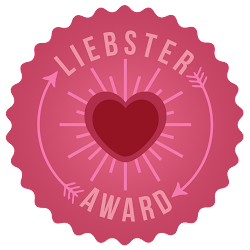 Oh and brownie points if you realised that I've switched up the font a bit! Nice blog and thanks for sharing!